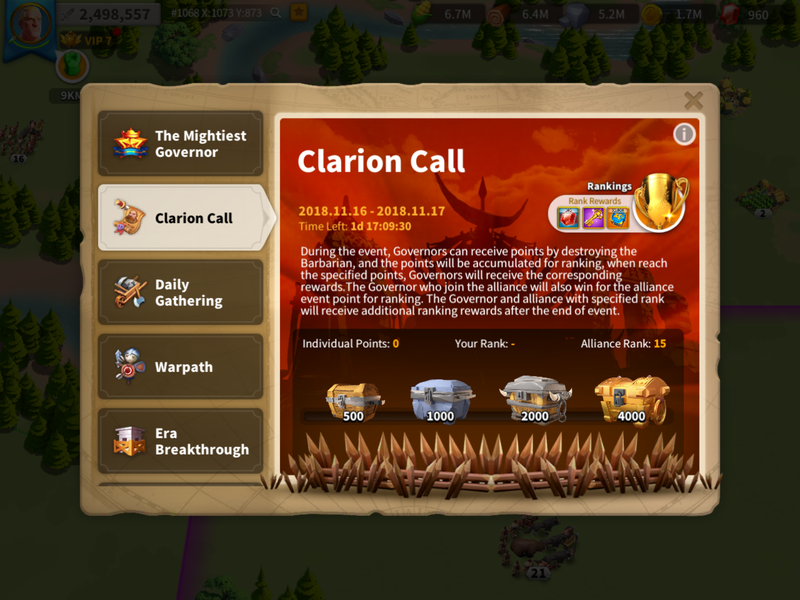 Destroy barbarians in this time-limited special event to receive chests and try to compete for the ranking rewards for individuals and alliances. Rewards includes gems, golden keys and speedups for this individuals in the top 100. And tomes, chests and army power ups for alliance members in the top 20. Other rewards are on offer as you destroy more barbarians on the map and reach certain stages. Check the requirements out and running dates via the notepad icon on the top right of the game screen. Send out multiple groups of troops to defeat the highest ranking barbarians that you can for the best rewards. Start early with this one and use up all of your Action Points. Players going for the top positions in this event will consume loads of Action Point recovery items, so if you are going for one of the top ranks, be aware that you'll being using up tons of Action Point recoveries. You will at least be gaining XP and Tomes for your commanders for each Barbarian group that you defeat. Look out for your Peacemaker Commanders, like Lohar and Boudica, these guys have reduced Action Point consumption levels in their Talent Tree. Over the long run, this will save you loads in Action Points. As well as the rewards you get for defeating barbarians, if you rank in the top 100 of your kingdom, then you'll get some individual rewards at the end of the event also. Check the event menu for the specifics as these may change from time to time, but they are usuall quite good and include gems and speedups, depending on how high up you finish. Also on offer are Alliance rewards, all members of the top 20 alliances per kingdom will a selection of rewards which include tomes of knowledge, resource chests and alliance credits, again depends on how high up you finish as to what you get exactly. It's always best to send multiple armies out to defeat the highest level barbarians that you can, that will maximise your return for the effort and time it takes to participate in this event. An alternative method is to just use commanders that consume the least Action Points (Peacekeepers, with reduced action point talents), to conserve your action points.